We have not moved beyond race. St. Louis does not have a proud history on this topic, and we are still suffering the consequences of decisions made by our predecessors. However, it's important to understand that racial inequity in our region is not the same as individual racism. We are not pointing fingers and calling individual people racist. We are not even suggesting that institutions or existing systems intend to be racist. What we are pointing out is that the data suggests, time and again, that our institutions and existing systems are not equal, and that this has racial repercussions. Black people in the region feel those repercussions when it comes to law enforcement, the justice system, housing, health, education, and income. Rev. Starsky Wilson, Rich McClure, et. al., "Forward Through Ferguson: A Path Toward Racial Equity," The Ferguson Commission, September 14, 2015. 7. http://forwardthroughferguson.org/wp-content/uploads/2015/09/FergusonCommissionReport_091415.pdf. They freed and recognised their mixed-race children, setting them up as plantation-owners in their own rights. A mixed-race property-owning class emerged, equal in rights and wealth to their white neighbours and relatives. 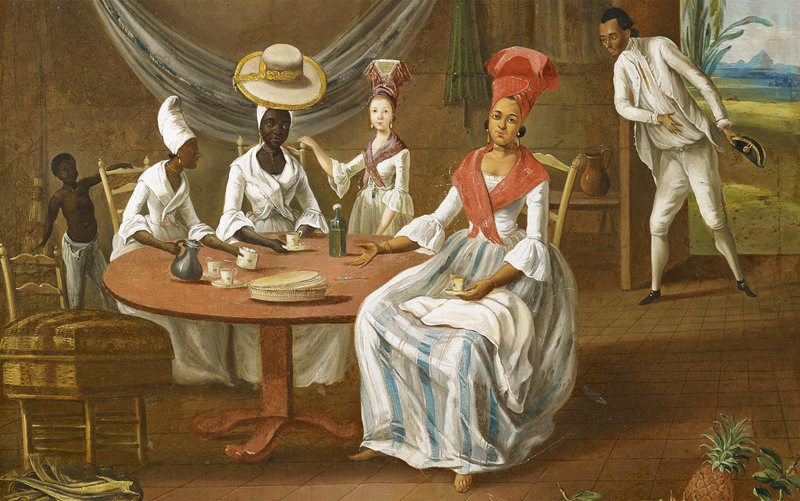 Developing a genealogy of racial prejudice in Saint-Domingue, [Julien] Raimond began with a study of the colony’s history. He noted that, in the early 18th century, during the first generations of the colony’s existence, almost all the white settlers who travelled to the colony had been men. They had married African women. They – and the French state – acknowledged these relationships. They freed and recognised their mixed-race children, setting them up as plantation-owners in their own rights. A mixed-race property-owning class emerged, equal in rights and wealth to their white neighbours and relatives. By the 1760s, however, white colonists increasingly saw free people of colour as a threat to access to land and capital in a colony that was increasingly crowded, filled with recent immigrants from France seeking to become rich. Using racial difference as a weapon in their economic struggle, white colonists began to impose discriminatory legislation against mixed-race people. Blake Smith, “On prejudice,” Aeon, March 5, 2018. https://aeon.co/essays/what-if-prejudice-isnt-what-causes-racism. Comments Off on They freed and recognised their mixed-race children, setting them up as plantation-owners in their own rights. A mixed-race property-owning class emerged, equal in rights and wealth to their white neighbours and relatives. n 1791, Julien Raimond published one of the first critiques of racial prejudice. Raimond was a free man of racially mixed ancestry from the French colony of Saint-Domingue (today the country of Haiti), and his essay ‘Observations on the Origin and Progress of White People’s Prejudice against People of Colour’ argued that legal discrimination against people of African origin resulted from psychological biases. Raimond’s work was the first sustained account of how racial prejudice operates – and how it might be eliminated. Today, the idea that unconscious biases permeate individual psychology, prompting discriminatory behaviours and perpetuating social inequality, is central to discussions of race in politics, academia and everyday life. But this idea was the product of a specific 18th-century moment, with surprising and troubling motivations behind it. Raimond was an activist for the rights of people of colour. In 1789, he left his home in Saint-Domingue just before the outbreak of the French Revolution. He went to Paris to lobby the government to grant equal status to free people of African origin. In Paris, Raimond joined a circle of radical thinkers and politicians who believed that racial equality had to be part of the emerging Revolution. But Raimond was no opponent of slavery. On the contrary, while his allies argued for its abolition, Raimond insisted that racial equality and abolition of slavery had nothing to do with each other. The first page of his treatise claimed that a cabal of ‘white plantation-owners … have cleverly conflated the cause of people of colour with that of slaves’. Raimond, in fact, wanted to preserve slavery. He believed that eliminating racial prejudice would bring white and non-white slave-owners together in a united front against enslaved Africans. He drew on the pro-slavery arguments of white plantation-owners. Raimond’s idea that there is such a thing as ‘racial prejudice’ and that discrimination is rooted in this psychological phenomenon originated in these plantation-owners’ defences of slavery.